Is New Zealand Tourism Going Downhill? In recent years the cruise ship market visiting New Zealand has developed considerably with larger numbers of ships and visitors than ever before choosing to visit our shores in their floating hotel. The recession is one reason this has come about – with the combination of competitive deals on offer by the cruise ship companies and the attraction of having all meals included it makes for an easy and more affordable holiday. It’s a trend happening worldwide that we need to work with and not fight against. The coach tour market in particular has been significantly affected with large downturns in their bookings, which in turn impacts on tourism businesses that have traditionally worked hard to attract bookings from this market and have built strong relationships with drivers and guides on their route. While accommodation providers and tourism activities not based near a cruise ship port miss out on this market altogether. But beyond the negative impact of this shift in how tourists visit New Zealand, what are the positives for our industry and what strategies can we use for this new era for tourism? Areas with port facilities have to improve their infrastructure and services around cruise ship visits to ensure visits run smoothly – not only is it the physical ports that may need upgrading but also transport while visitors are ashore, booking offices to help them plan a day on land, plus food and hospitality options that are affordable with a range of choices on offer. Food stalls and markets set up just for the duration of the ship visit are a good example of this. Out of town vendors can plan to come to these markets to take advantage of these visits. You personally may not have overall control over these things but you can help to drive your local council and business associations to be creative and plan for these things. Tourism operators should be thinking about how they can offer special events or attractions based on their core activity to suit cruise ship passengers – can they offer day trips with transport included to get the ship visitors to them? Or can they bring their attraction to the cruise ship visitors? For example a cultural attraction based in Rotorua may plan to offer a “mobile” cultural show in Tauranga while ships are in port. For those businesses that simply don’t have a product to get bookings from cruise ship visitors will need to become even more effective at attracting the FIT market. Coach tours may no longer bring those big numbers to your door each week so your marketing strategy needs to include attracting the individual travellers via a variety of mediums. Don’t give up on those coach tour companies though, continue your relationship with them – they will be strategising ways to get some of their market share back so you need to hang in there with them. Love this article. Very relavant and helpful! Thank you! The article is interesting and relevant, but cruise ships and especially the larger ones can come with issues for smaller communities. My experience with cruise ships is totally on Stewart Island. Many years ago we used to get a couple of port calls by the Lindblad Explorer at the end of their 30 odd day Antarctic cruises. The local Lions Club, with assorted local businesses used to put on a variety of local tours, a barbecue and other small scale events for the 80 odd passengers. These worked extremely well, I assume profitably and the passengers and the community involved had a ball. After a significant gap the Island again became a stop for cruise ships. Initially pocket cruisers of around 85 to a couple of hundred passengers. Again the model worked well, with local operators offering short Ulva Island Guided walks, village road tours and of course the usual retail experience within the village. These ships invariably anchored in Paterson Inlet and passengers came ashore at Golden Bay. This wharf is our smallest, and also is a real marine and road bottleneck and is about 15 minutes walk into the village centre. It is also our busiest wharf in vessel movements, as it is the departure point for most water taxis to Ulva Island. However the small numbers of shuttle launches had little impact on the overall working of other operators. However a few years ago we started getting much bigger ships, with up to 14/1500 guests aboard. Again they anchored in Paterson Inlet. A continuous stream of their shuttle launches, each with up to 70 passengers completely overwhelmed the limited wharf space at Golden Bay, with a significant impact on local operators who were still of course servicing the regular visitors. Add to this road congestion and it developed into a real problem for anyone who got tangled up in it all. Another potentially more serious issue is weather. Our weather here is very changeable, and the forecasts don’t always get it right. The bigger ships are side, rather than stern loaders and so are quite vulnerable to wind when transhipping passengers. In fact the very first of the bigger ships came close to leaving the majority of their passengers ashore. Something that had been pointed out to TNZ at the time, but had been more or less poo pooed. Suggestions that the larger ships anchor in Halfmoon Bay where the much larger wharf would better cope, where berths could be set aside for the ships tenders, and the passengers would have just a 3 minute walk into the village centre seem to have been ignored. And in addition the ships would be anchored in a lee, and so far less vulnerable to wind. As an aside I wonder just how Stewart Island would cope with a big ship load of storm stranded passengers. It would certainly get someones attention I suspect. Those are more operational aspects of large ship visits, but also communities should think about the social impact on such large numbers of visitors. To explain. Stewart Island has a population of some 400 people, living on a total road structure of 15k, with most within a 1.5 radius of the village centre. At a guess our peak daily “regular” visitor loading, which includes crib owners, guests at assorted accommodation providers and day trippers probably is around 600 people. We actually cope moderately well with this total of a 1000 people. But add to that 1400 cruise ship passengers plus off duty crew, and all of a sudden the local community has grown by over 500%. Think how your community would cope with this percentage influx confined within a few hundred metres of the town centre. Some local businesses do well… restaurants, hotel, gift shops, some of the nature guides and tour operators. But for probably most residents big cruise ship days are a good time to be someplace else, and for those whose business takes them into the middle of the scrum they can be a down right pain. This is to some extent reflected in comments about rude locals. Which is sad, as these folk are guests in our communities, but perhaps the impact on small communities is more than can be born. Communities, and the cruise operators should think about this. Thanks Peter, yes it definitely helps if the community can cater well for an influx of visitors – things like adequate public toilets to cater for the intense demand can be a big issue and poor facilities of this nature can leave a bad impression and a mess for the locals to clean up afterwards. These aspects all need to be managed well and if possible things like the ideal ship anchor and wharf tender locations worked through with the cruise lines. Communities keen to harness the benefits of cruise ship visits would do well to form a committee or group of interested people that aims to manage this all effectively. 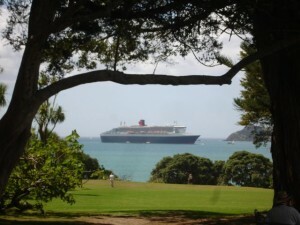 In Paihia for example they have developed a Cruise Ship Ambassador Scheme which is self funded by the local businesses – it’s success is evident in the growing feedback by ship visitors as it being a popular port of call. Very true. Stewart Island has of course been given the right to impose a visitor levy, and I understand to their credit that Cruise NZ have agreed to pay this on the entire passenger compliment, rather than just those who come ashore. Crew will be exempt. This money is to only be spent on visitor focused infrastructure. For example we desperately need footpaths for visitors, although the deeper issue may be in persuading tourists to actually use them. Browns Cows springs to mind even where we do have footpaths.